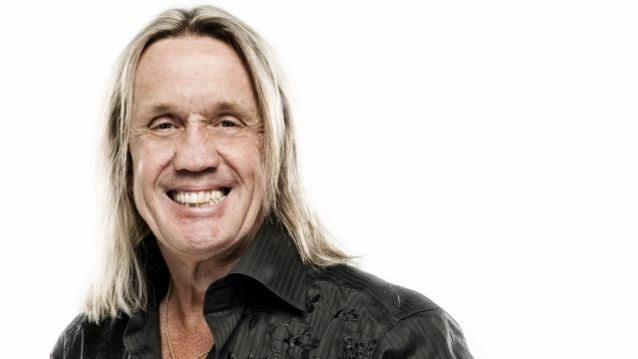 IRON MAIDEN drummer Nicko McBrain, who is also a noted car enthusiast, drives a custom Jaguar XKR-S adorned with the band's font and painted a singular shade of blue. The longtime Jaguar aficionado recently took The Wall Street Journal out for a spin. Check out the video below, and read the full article at this location (subscription required). In 2012, McBrain decided to have British automaker Jaguar commission him with a special-edition XKR-S shortly after taking the sports car out for a ride out on a race track. At his behest, Jaguar jumped at the opportunity, dressing up McBrain's XKR-S with an Ultra Blue exterior paint job to go with a red and black interior that comes complete with IRON MAIDEN references. The door sills, in particular, were engraved with a "Nicko McBrain XKR-S" inscription using IRON MAIDEN's iconic font style. The same font was also used on the carbon fiber hood louvers where the word "Supercharged" was engraved to. "Since I was a kid, I've always loved Jags with a passion," McBrain told AutoEvolution. "I remember my father taking me to see the big ol' Mark 10 when it came out in '61. That was his favorite car, and since then, I've always preferred Jaguar sedans rather than sports cars. In fact, I still have my Series III that I bought in 1986 along with my '89 Series III that I keep in Florida and use as my daily driver. I bought my wife an XK in 2009, and when she finally let me drive it, I absolutely loved it; so when the XKR-S came out, that was it, I decided I had to have one." Asked when he first got to drive the XKR-S, McBrain said, "Jaguar invited me to the Gaydon test track in the U.K. to do a few laps, and really, that's how my car came about. They drove me to the track in a new Range Rover Evoque with a terrific black and red leather interior. When we pulled up alongside this French Racing Blue XKR-S, the door was open. When I opened my door to the Range Rover Evoque, I said, 'This is the interior I want in my car.'" Regarding what features he decided on, McBrain said, "The first major feature we worked on was the paint; I chose a new metallic version of French Racing Blue. Jaguar calls it Ultra Blue and they agreed to let me use it for my car. I live in Florida and when the sun hits the paint, it just explodes, the color is truly amazing. Next, we wanted to really customize the car so where it says 'Supercharged' on the carbon fiber hood louvers, we've used the famous IRON MAIDEN 'metal lord' font. We used the same script for the door tread plates, which now read 'Nicko McBrain XKR-S.' In the piano black veneer above the glove box we've added 'Made In Aluminum;' get it?"